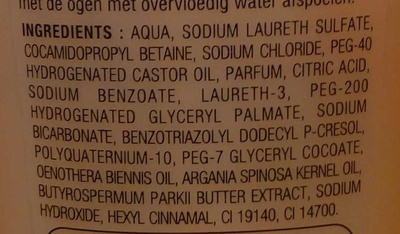 AQUA, SODIUM LAURETH SULFATE, COCAMIDOPROPYL BETAINE, SODIUM CHLORIDE, PEG-40 HYDROGENATED CASTOR OIL, PARFUM, CITRIC ACID, SODIUM BENZOATE, LAURETH-3, PEG-200 HYDROGENATED GLYCERYL PALMATE, SODIUM BICARBONATE, BENZOTRIAZOLYL DODECYL P-CRESOL, POLYQUATERNIUM-10, PEG-7 GLYCERYL COCOATE, OENOTHERA BIENNIS OIL, ARGANIA SPINOSA KERNEL OIL, BUTYROSPERMUM PARKII BUTTER EXTRACT, SODIUM HYDROXIDE, HEXYL CINNAMAL, CI 19140, CI 14700. Product added on March 22, 2016 at 5:23:32 PM CET by sebleouf. Last edit of product page on March 26, 2016 at 11:50:20 AM CET by .